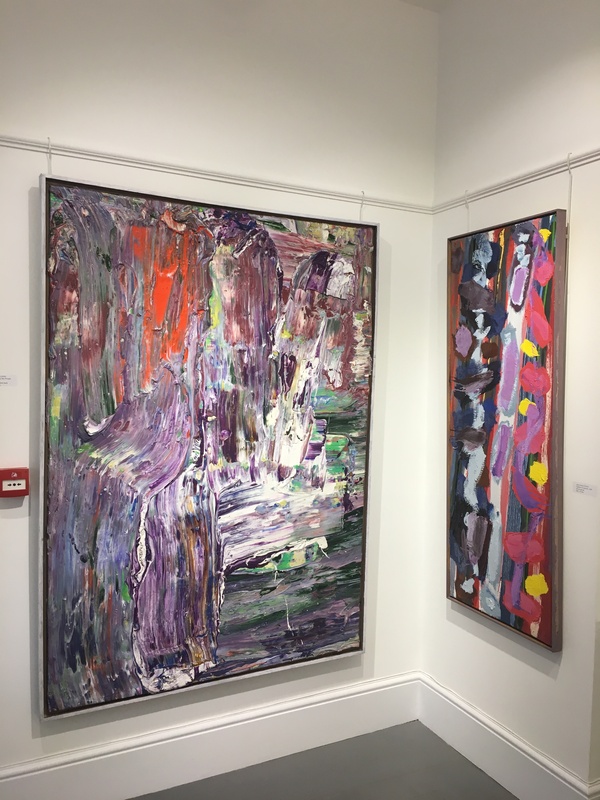 We also see these paintings in hindsight; in the context of nearly three more decades of Gouk’s vigorous commitment to abstract painting that have followed as abstraction has fallen in and out of favour in contemporary circles. Unaffected by medium denying conceptualism; the often announced ‘death of painting’ itself; and the so-called post-modern/multi-media innovations (for the sake of ‘contemporaneity’) that developed from the 1970s onwards – Gouk has continued to explore the endless scope of his particular form of abstract painting and unashamedly celebrates its ‘medium-specificity’. This is also a slightly unusual retrospective, as in most instances a body of works from various private and institutional collections would be presented in a much larger and grander setting. These particular paintings are gleaned from the artist’s own archive and perhaps are typical, in a piecemeal way, of the collections that some of the many painters who follow AbCrit will have themselves. This will include paintings left over (unsold) from a particular series that has otherwise been broken up; works that pay homage to a major influence (Incandescent Ruby Rose and Dark Green Shape from 1987 must owe allegiance to Patrick Heron); or reveal evidence of a potential area of exploration touched upon but diverted towards other ends (Pomegranate Burst suggests a future into a colour-field aesthetic with atmospheric effects of colour predominating rather than the sheer physical presence of paint applied to a surface to evoke a more concrete colour-space – and Gouk has spoken openly of his response to New York painters in the early 1970s). Additionally, some works may be kept because they are personal favourites – or mark significant points in time on the journey through painting. Early works can also acknowledge (consciously, or otherwise) influences from past and present. Just as the spirit of Cézanne may be here, so too are Hofmann and the aforementioned Heron. The pitfalls of an idiosyncratic selection have been commendably avoided for this show. Nothing on the walls looks out of place and the variety of imagery is held together with Gouk’s uncompromising dedication to making paintings that, to varying degrees, can stand alone and look as fresh today as when they were painted. This could certainly be applied to two acrylics from 1979: In The Wake of the Plough (displayed previously in the University of Greenwich’s ‘Stockwell Depot’ show in 2015) and Pigskin Pushover. Both works appear to take the actual and implied pictorial space beyond the rectangle, but are contained and composed within the physical frame of reference. This spatial feature, or characteristic, of Gouk’s work is still a dominant attribute today. The chronology I sense could be incorrect, but Keel Haul (acrylic) and Coal Hewer (oil) appear to lead us to Quercus (oil), all 1981, which is displayed in the window of the gallery. Keel Haul presents a fragment of canvas stapled for immediate effect onto the stretcher with the confident nonchalance of a young artist presenting the vigor and liveliness of a painting over merely tidy presentation. 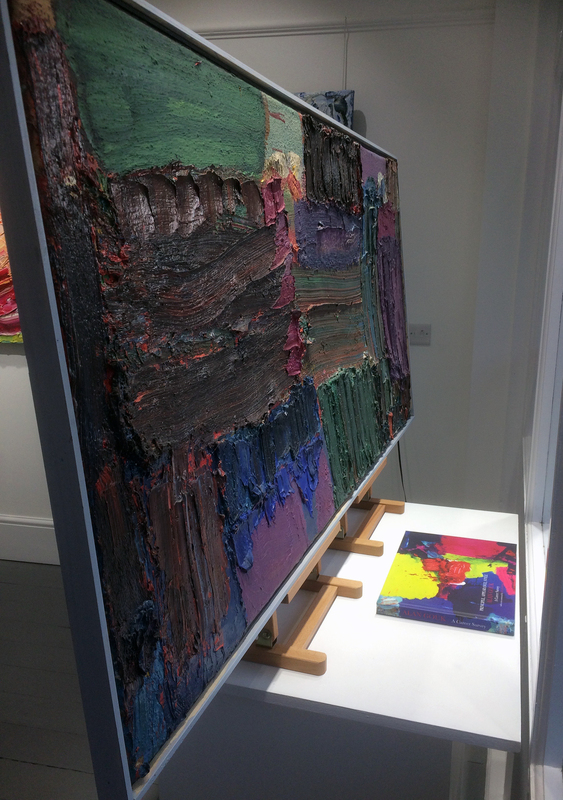 Very thick paint appears to have been applied after this re-sizing and the energy and physicality of the work is reflected in the title. Is this a visual (and tactile) mission statement for the development of abstract painting? The endeavour to be an abstract painter may be challenging and unfashionable at times, but the vagaries of the contemporary art marketplace and the incremental pace of change in culture, too affected by commercial factors, can make any genre of painting seem reactionary or passé. But an artist has to be in the business for the long haul – whatever abrasive experiences or critical pronouncements challenge a lifetime’s project. Quercus could be easily missed as it faces out of the gallery, but it might be one of the highlights from the show. The title may unintentionally suggest the landscape (referencing the Oak tree) and the format is ‘landscape’, but this is beside the point as the inner-architectonic vitality of the work could reference any sort of vertical/horizontal edifice – of the body, compacted woodland or a building. This laterally extended, or panoramic, rectangular shape of his paintings has become a well-established feature of Gouk’s oeuvre. The format implicitly makes the work physically grounded, as in executing the work or stepping from side to side to take a closer look, keeps the artist’s and the viewer’s feet on the ground. Most of these wider formats are displayed in the larger room on the ground floor, with the exception of Across The Irish Sea (1987) that was displayed on an easel downstairs and did not benefit from a cramped space – which created a temptation to carry it upstairs to see the light of day. The earthy hues in The Lamp (1982-83) develops the palette of the three paintings mentioned before Across the Irish Sea, but a more refined confidence in paint handling produces an almost serene effect. I don’t know, but surely Sean Scully (just 6 years younger) was influenced by this, or similar, work? But, whereas Scully has a certain impressive slickness to his painting style and application, Gouk always retains a degree of overt physicality that sometimes verges on visual and tactile discomfort. There is often a sense that the painting could implode or fall apart, such is the surface tension in The Lamp that has a subtly kinetic effect. This seems even more apparent in Bougainvillea-Sitges (1989-90) that dominates the main gallery space and created an impact that was physical as much as visual. A heavy impasto of super-Cézannesque marks fills the 96X300cm canvas. It is visually almost unwieldy, but holds together nonetheless, on the brink of chaos and collapse. It’s one of those paintings that draws you in to eyeball the surface from the tip of your nose, but also requires the viewer to stand well back to take it all in. So, from Pomegranate Burst (1973/74) to Nightjar Footprints (1989) the various paintings (on flax, linen, cotton duck and board) successfully introduces (or reminds) the visitor of this first major era of Gouk’s long journey. 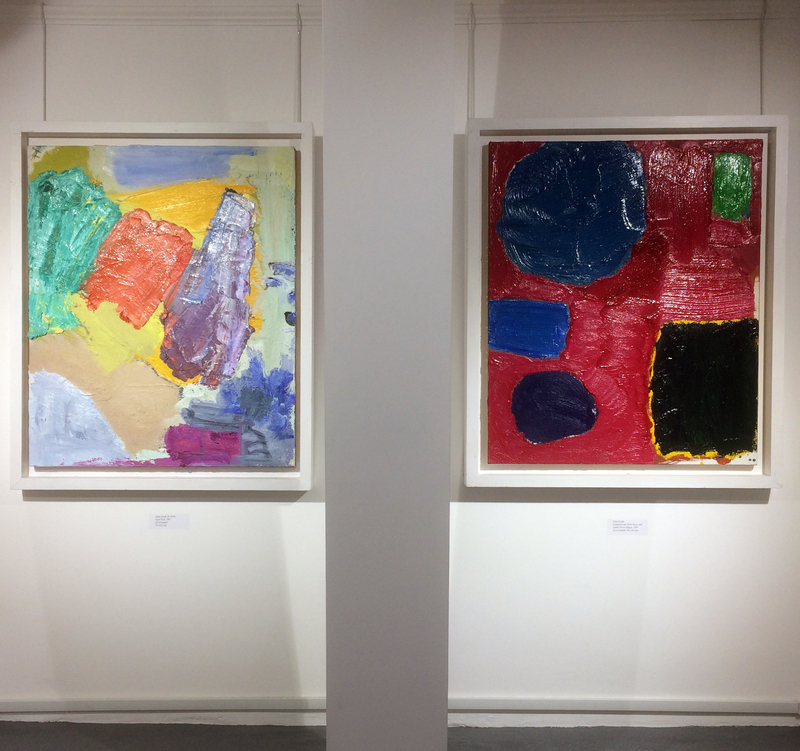 But whatever the contingencies and the readjusting of pictorial interests in the work of Gouk’s early career the unremitting commitment to exploring qualities and potentialities of colour, space, paint and painting is clearly established from the start and continues today. A second show is planned by Felix & Spear for a middle period retrospective at a later date. That’s good news, but it’s high time the British public was treated to a full-scale Alan Gouk retrospective at Tate Britain. Are you listening, Alex Farquharson? Note: Many of the paintings in this exhibition are reproduced in the essential career survey publication, Principle, Appearance, Style (Poussin Gallery), in which Mel Gooding has constructed a text from Gouk’s own discussions of his work. This book is available from the gallery during the exhibition, as well as Sam Cornish’s, Stockwell Depot 1969-79 (Ridinghouse) catalogue that also features Gouk within the context of developments in abstract painting and sculpture at this time. All images © the artist, courtesy of Felix & Spear (Fine Art) Ltd. Thanks for this nice little appetiser Geoff. I look forward to seeing it tomorrow. Ah yes this is such an amazing show, the power and character in each work is extraordinary! Geoff Hands’ review is very good, it has insight and understanding and I definitely agree about a Tate retrospective! If only! I really appreciated the more somber paintings too, where strong accents gradually surfaced the more one looked, searing aqua in ‘Keel Haul’ for instance and rich greens and purples in ‘The Lamp’. These paintings have a physical effect like they’re hitting you in the chest. I agree with Noela – this is a rather original slant by Geoff on a show, which perhaps surprisingly, is one of Alan’s best. This might be because of the mix of work, very well chosen and hung (not overhung) in such a small space. 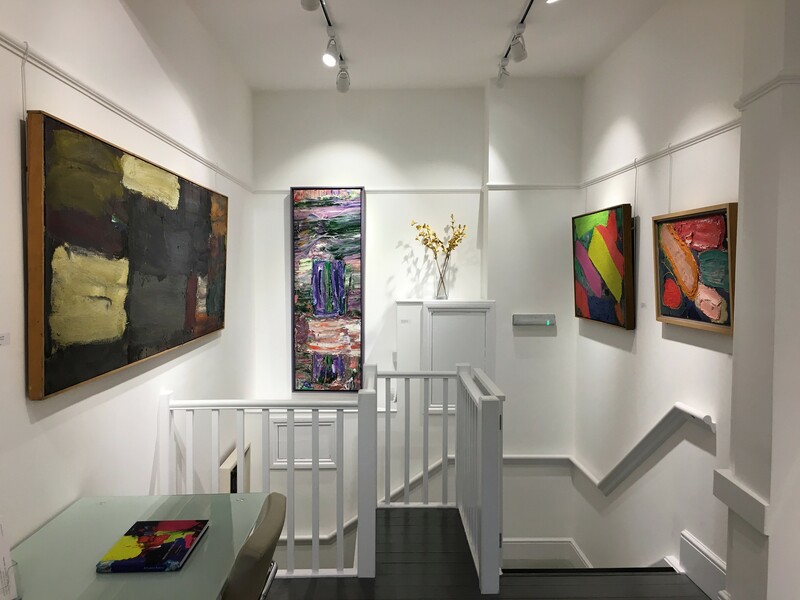 Each distinct painting has been given the opportunity to tell its own story without an overbearing effect from the whole installation, which I think is an excellent achievement by the gallery. Alan comes across as the class act we always knew he was. What’s more, I have no doubt that if you had access to all his work (not just the unsold stuff) from these periods you could construct two dozen shows at least as good if not better. 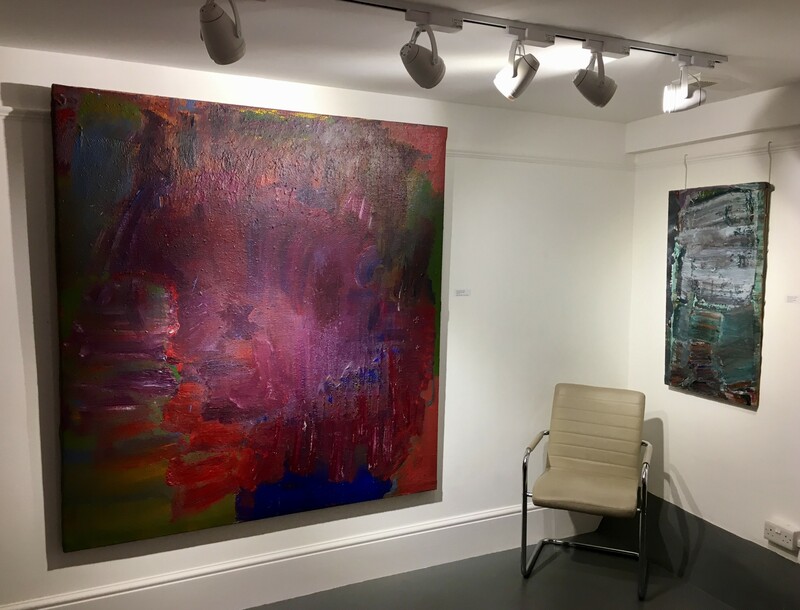 Catch this show before it closes, and take in the Gary Wragg mini-retrospective at Paisnel Gallery too – a very interesting opportunity for comparisons, about which I’ll say no more at the present. What’s with all the mini-retrospectives anyway? I’m told by Alan that he chose and hung the show. Well done. Here’s the Thought Experiment that occupied me last night having seen the exhibitions of Soutine, Cezanne, Modigliani and Gouk in quick succession. IF it were possible to see the Cezannes and Gouks without the acquired baggage of prior knowledge, reputation and learning (Cezanne’s innovations and undoubted place in art history, Alan’s encyclopedic knowledge and forcefully articulated insights) then what would your conclusions be – taking only those works on first viewing? Imagined that way, for me, Cezanne becomes a dreary academic painter, so obsessed with a technique that he renders the vital inert. The living person, our very definition of life, becomes a cardboard cut-out, static and inorganic. [ Cameron Amiri of Felix and Spear – well done on a difficult hang btw – relayed that an artist who had seen the Cezanne show remarked that he painted ‘still lives not portraits’- well said]. Trying to see Gouk’s work afresh creates the opposite impression. The abstract is rendered real, specific and dynamic. Something is conjured from nothing. What you see in each picture is a real thing, with it’s own presence, it’s own personality, complete. For me it was a role reversal, I’d seen Alan as the ‘Academic’ painter, searching for the elusive, but I’m tempted to lay that label at Cezanne’s door. And it is Gouk’s work that has the alchemy and authority of the master craftsman. My erudite educators on matters Abstract (many of whom frequent this speakeasy) taught me “it’s the look of the thing” and not the accompanying notes that matter. On that criteria I know which works I’d like to take home with me. As possibly one of your erudite educators on matters abstract, I’d just like to say that hell will freeze over before I start to think of Cezanne as a “dreary academic painter”. It is true, though, that unlike Alan, he doesn’t hang many of his own shows these days. John, I don’t really share your views on Cezanne vs Gouk. But do you think your differing responses are because abstract art gives you something that is not there in figurative art (or vis-versa)? This pretty fundamental and obvious point – although is it hard to define precisely what is offered by abstraction? – often seems to be missed around here, where there is a tendency to emphasise continuity between abstract art and figuration, and to try and measure them by the same standard. I think any attempt to answer that needs to differentiate between painting and sculpture. I don’t think you can generalise about the two of them. Not so sure that comparing Gouk with Cezanne is wise. Cezanne opened up and expanded the possibilities for painting (and sculpture), via Picasso and Braque, to give painting even more autonomy from the academic/figurative. The astounding Soutine paintings at the Courtauld Gallery add a psychological/colour dimension to so-called figurative portraiture – not so much in the almost cartoonesque imagery – but in the application of the medium and in the backgrounds (that is, the surface around the notional subject matter of the portraits). 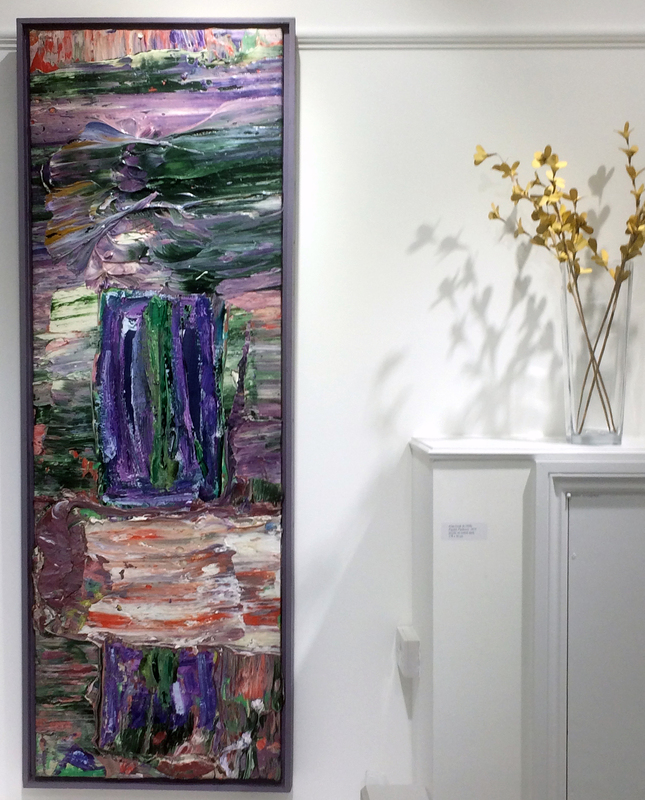 Talking of the Courtauld – what about those Auerbach’s and Kossoffs’ in the adjoining gallery? Not sure the word ‘via’ here is correct Geoff – I know what you are getting at though and appreciate the argument but I do not share the view that cubism was the heir apparent to Cezanne. I have written about this on Abcrit before. Picasso and Braque seemed to me to employ much of the vernacular of Cezanne including his palette (in a simplified form as the current Cezanne show demonstrates a quite remarkable breadth and deftness of paint and colour handling which exceeded anything that these two artists managed working out of him – as good as the majority of it was, it should be said though too!) Matisse owned a Cezanne for over 37 years, absorbed it and acknowledged it still had mysteries for him and he responded in a much more significant way (again for me at least). He realised that to get at Cezanne you needed something else that was equally potent as a catalyst instead of tones, planes and localised colour relationships. Matisse looked to Giotto, Russian icons, Japanese prints, African sculpture and a whole raft of other ‘cultural sources’ and imbued his paintings and of course his colour with a greater degree of forthrightness, a starker, more brutal drawing, severe architectonic structuring (cubism helping accelerate that I’m sure) then putting his line through marathon sessions looking at weight, pace and detail (a line that then liberated Picasso in turn) to come out the other end with an unshakable belief in colour. He was no magpie to style. I really liked John Pluthero’s championing of abstract painting too later in this thread – I would not agree the bit about the academic element but the unabashed enthusiasm for head first abstract painting is marvellous. I always like to see a fellow “Tigger”. I enjoyed seeing this show (Pomegranate Burst – downstairs was a favourite).The hanging was very well worked out as mentioned. “The lamp” had a very different tenure also with a cooler stillness about it. There’s a subtext that Geoff touches upon with his call to arms request to the Tate and it is a significant one. Authentic, full throttle take it or leave it abstract painting needs a proper platform – if only to untwist the painfully, sad, clever, contextual heavy, funding-chasing, austerity art that currently prevails…I would say that though: more painting that has tops made out of rubber and bottoms made out of spring wouldn’t go amiss! Correction. Of course the gallery’s director, Cameron, had a say in the hang as well. And he supplied details of the dimensions of the available spaces ahead of time. …but on the odd occasion when he did hang his own shows, Cezanne was less ambiguous. 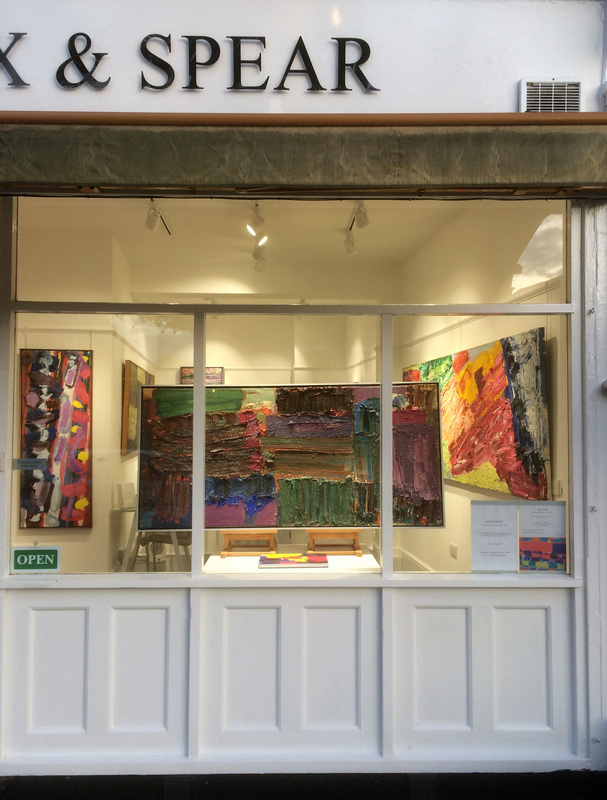 A great show, but why hang that particular (and lovely) painting in the window so it becomes, in effect, a triptych,in my opinion does no justice to it. It would have been a huge show if everything illustrated had been shown….